A new online route planner allows cyclists to map their journeys via off-road routes and cycle paths for the first time. The online system, commissioned by Transport Direct and Cycling England, has been created by CycleCity Guides following months of detailed surveys conducted by a 15-strong team of cycle-mounted mappers. Martin Whitfield, director of CycleCity Guides, said the new system allows cyclists to plan their route incorporating the Sustrans National Cycle Network, bridleways, canal towpaths and other off-road cycle paths. 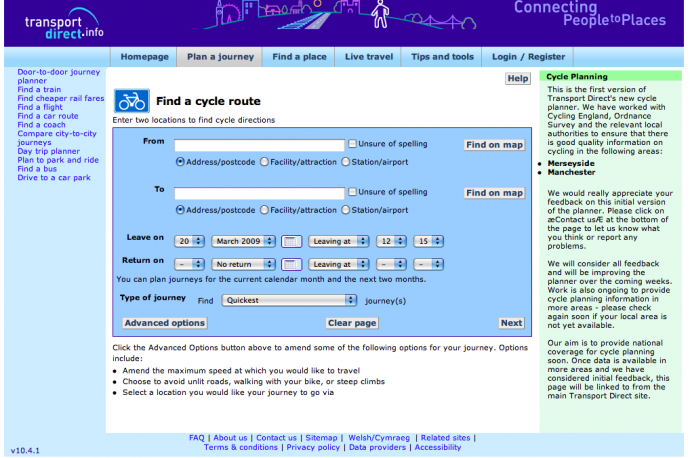 The route planner is part of Transport Direct – a multi-modal transport planner incorporating information for journeys by train, car, bus, plane and now bike. Speaking to road.cc from Bexhill-on-Sea, where he is busy conducting surveys for future versions of the system, Whitfield said: “To get off-road information Transport Direct and Cycle England have been commissioning us to survey the areas and get the non-road areas into the journey planner. So far Manchester and Merseyside are up and running on the test site, and all the Cycling England Cycle Cities and Towns, such as Bristol, Brighton and York, have been surveyed and are due to go online at a later date. After typing in their journey details users of hte site are given turn-by-turn written directions and a map, which can be broken down into detailed sections. This can also be downloaded as a GPX file to be used with a GPS system. Turn-by-turn GPS instructions are not yet available but Whitfield hopes once the system is more established, this will be an option. He says: “Hopefully when we have a large dataset of the country one of the big phone manufacturers will design turn-by-turn navigation software because they’ll have to adapt the software they already use for in-car navigation. Get a first look at the test version of the website here. The final version is due to go online later this year.